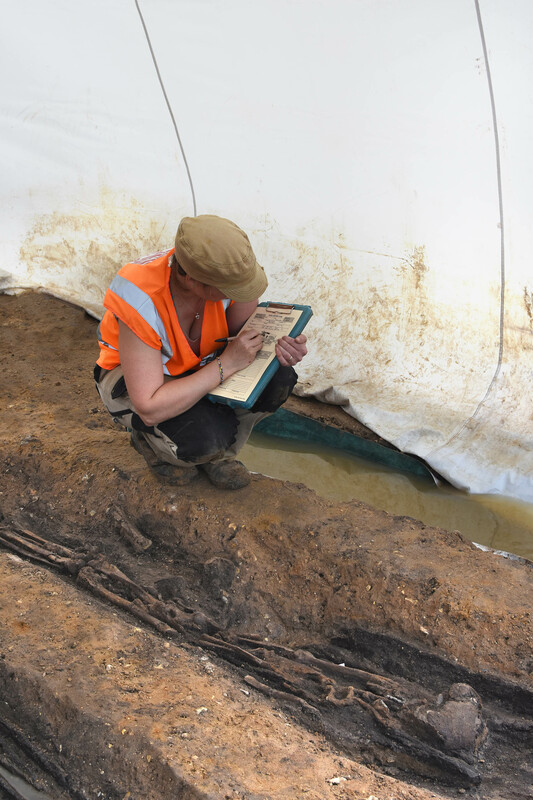 Our team in Northampton have uncovered an important Anglo-Saxon cemetery in an excavation funded by Historic England in advance of a conservation and fishing lake and flood defence system at Great Ryburgh in Norfolk. The waterlogged conditions of the river valley led to the remarkable preservation of burials that are extremely rare in the archaeological record, including plank-lined graves and tree-trunk coffins dating from the 7th-9th century AD. 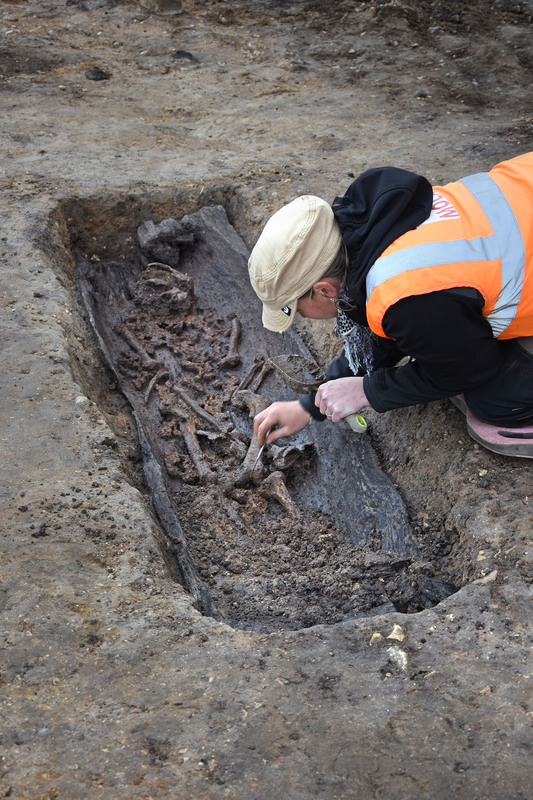 We've been able to reveal evidence that this may have been the final resting place for a community of early Christians including a timber structure thought to be a church or chapel, of which there are few examples from this period. 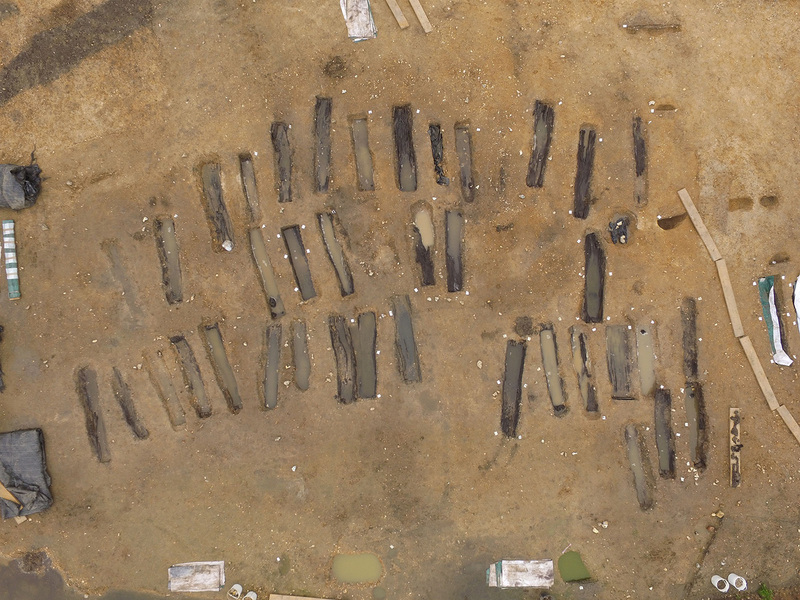 The wooden grave markers, east-west alignment of the coffins and the evident lack of grave goods all support the Christian origins of the cemetery. Anglo-Saxon coffins seldom survive because wood decays over time. Until now, evidence of these amazing burials has largely consisted of staining in the ground from decayed wood, but we've been able to properly excavate these rare and fascinating coffins, graves and skeletons because they have been brilliantly preserved in the ground in a combination of acidic sand and alkaline water. Take a look at a 3d model of a dug-out coffin from the site here! The 81 dug-out coffins discovered comprise oak trees split in two length-ways and hollowed out. This type of coffin is first seen in Europe in the Early Bronze Age and reappears in the early medieval period. From Britain they are mentioned in antiquarian records from the late 19th century, but this is the very first time they have been properly excavated and recorded by modern archaeologists. We know that the burials, in hollowed out logs, were positioned in the lower half and the upper half rested on top to form a lid. Although they aren’t decorative, it would have taken considerable effort to hollow a single coffin, an estimated four man days. The fact that evidence for similar burial rites is also found in earlier cemeteries may signify the blending of pagan and Christian traditions. The six plank-lined graves are very rare in in this country and these are believed to be the earliest known examples from Britain. The graves were cut into the ground, lined with expertly hewn timber planks, the body placed inside and planks positioned on top to form a cover. The relationship between the two burial types is not fully understood, but may denote an evolution in burial practices. Tree-ring dating is being undertaken to date the timber. The discovery is shedding light on a previously unknown religious site and the fascinating lives of this early Christian rural community. Continued research and scientific testing, in the form of ancient DNA, stable isotope and dental calculus analysis, will help to develop biographies for the people buried and paint a picture of the people who lived here. Archaeologists hope to be able to say more about where these people came from, whether they were related, and what their diet and health were like, once research is complete. This article reveals what developers need to know about human remains and how archaeologists can help them progress their projects.